The flowering cherry tree puts on stunning display of beauty that announces the beginning of spring its white and pink blooms. Once the blossoms are gone, the tree's dark-green foliage brings beauty to your yard or garden.The flowering cherry tree is small in stature and normally healthy, but it is susceptible to a few common cherry tree diseases. Bacterial canker, caused by the bacterium Pseudomonas syringae, affects the flowering cherry tree when the weather is cool and wet. According to Oregon State University, brown, slimy-looking spots appear on leaves. The spots eventually leave holes in the foliage, giving them a lace-like look. Canker spots may spread to new shoots and kill them. Branches infected with canker wilt, and leaves turn yellow or brown as the weather warms. Tree buds will not open in the spring. If the canker becomes systemic, the tree will weaken and eventually die. Bacterial canker can be prevented by pruning infected branches in the summer or when trees are dormant. It can be controlled with a copper-based insecticide when leaves begin to fall and again before buds open. Two fungi, Monilinia fructicola and M. laxa, cause brown rot blossom blight. Signs of brown rot--brown or gray-colored fuzz on the twigs--become evident in the early spring when the weather is damp. Brown rot leaves the blossoms on flowering cherry trees with a wilted, frost-burned appearance. The fungus spreads deeper into the tree as it enters through the spurs and twigs of the tree. Gumming may occur if there are lesions or cankers on the twigs as spores spread. Brown rot blossom blight can be treated with a fungicide in early spring. Washington State University suggests three applications of fungicide: one when the tree is budding, one when it's in full bloom and again when flowers have dropped . The flowering cherry tree is highly susceptible to powdery mildew, which is caused by a common fungus, Podosphaera clandestina. Airborne spores spread powdery mildew among plants that are too close to one another and living in cool, humid conditions. Powdery mildew has a white, velvet-like appearance and coats the leaves of the flowering cherry tree. Infected leaves curl, shrivel and prematurely drop. The Ohio State University states that powdery mildew is not fatal, but it does lead to defoliation, and infected trees will become dormant earlier than normal. Powdery mildew can be prevented by purchasing disease resistant cultivars, pruning diseased branches from trees, and removing and destroying all diseased wood and leaves from under your tree. 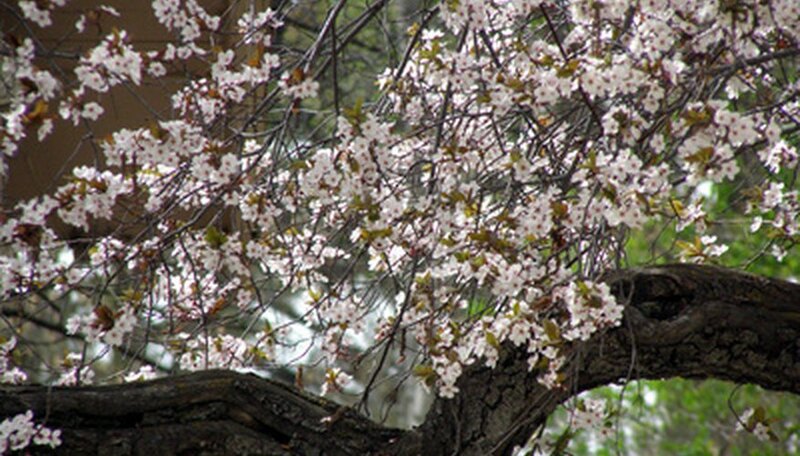 Flowering cherry trees should be sprayed with a fungicide three or four times during the growing season. Use a fungicide containing triforine, propiconazole and triadimefon.